The majestic Table Mountain is the most dominant feature of Cape Town and is the main reason for the city’s mystical appeal. Featured on the flag of Cape Town and other local government insignia, the Table Mountain dominates all photographs of the Mother City and is considered as one of the natural wonders of the world. Table Mountain is visible from all parts of the city and serves as a beacon for finding direction. This magnificent mountain is a part of the Table Mountain National Park and a popular tourist attraction. From the top, one can experience unparallel views of the city and Cape Town’s beautiful beaches. The panorama stretches from Table Bay to False Bay; around the Table Mountain to the Hout Bay Valley and Kommetjie. The highest point on the mountain is 1,086 metres above sea level and lies on the eastern end of the plateau. It is marked by Maclear’s Beacon, a stone cairn built by Sir Thomas Maclear in 1865. Table Mountain is bordered on the east by the legendary Devil’s Peak. According to folklore, Van Hunks was a pirate in the early 18th century who finally retired from his eventful life at sea to live on the slopes of Devil’s Peak. He spent his days sitting on the mountain, smoking his pipe. One day a stranger approached him, and dared him to a smoking contest which lasted for days. Smoke clouds built up around the two contestants and a strong wind blew these clouds down towards the town. When Van Hunks finally won the contest, the stranger revealed himself to be the Devil, thus giving the peak its unique name. It is said that the two rivals disappeared in a puff of smoke. Legend has it that the cloud of smoke they left behind became Table Mountain’s tablecloth – the famous white cloud that spills over the mountain when the South-Easter wind blows in summer. To the right of Table Mountain, the spiral walk up Lion’s Head passes through silver trees and enchanting spring flowers. A walk around the mountain using this trail provides a 360º view of the Cape Peninsula and is a popular family outing. At the top a breathtaking panoramic view awaits you, with birds in the sky and a perfect picnic spot to spend some lazy hours enjoying nature at its best. Lion’s Head in turn leads to the rump known as Signal Hill which derives its name from the fact that it was used as a semaphore post for communication with ships at sea. The former tradition is maintained in spirit and the noon cannon is still fired daily from Signal Hill. After sunset, Signal Hill becomes a popular romantic spot and couples come here to enjoy the sparkle of the city lights with the backdrop of a floodlit Table Mountain. Table Mountain is a nature lover’s treat and is home to approximately 1470 species of plants, including over 250 different species of daisies alone. Many of these plant types are endemic and survive only in the unique ecosystem which is contained on the mountain. For animal lovers, Table Mountain has a unique experience in store: Baboons and porcupines are pretty common, as well as furry rodents called Rock Dassies (rock hyrax) that look like plump rabbits without ears. The most incredible thing about this animal is that its closest living relative is the elephant! The Dassies especially cluster around the upper cable station, near areas where tourists may discard food. The Table Mountain Ghost Frog is also an endemic species unique to this area. One may also find mongooses, snakes and tortoises along the tracks. The last lion in the vicinity was shot somewhere around 1802 while Leopards vanished from the mountain after the 1920s. Table Mountain Cableway is the easiest way to reach the mountain top while experiencing an unmatched 360 º view of the city. This activity is a definite must for any visitor. The cable car service started in 1929 and today it conveys as many as 600,000 people to the summit annually. 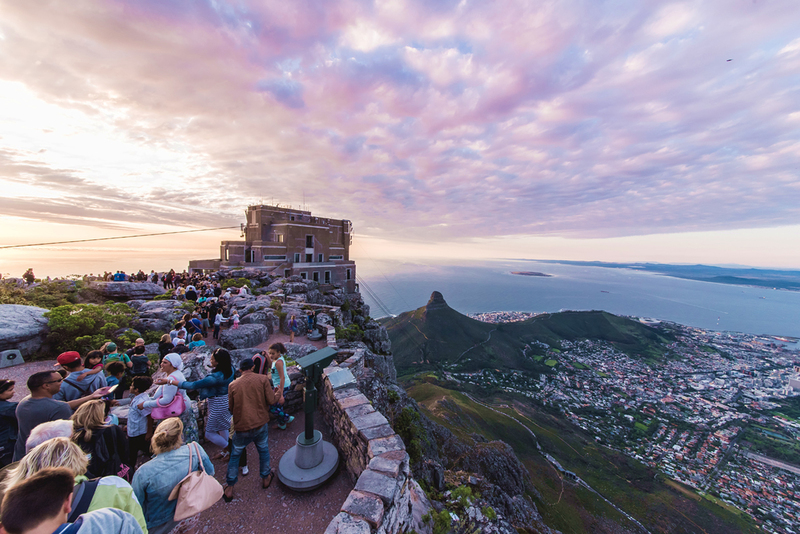 On the summit the visitors can have a meal at the Cape Town restaurant and a souvenir shop nearby allows visitors to send letters bearing the Table Mountain postmark. Rates for table mountain cableway are approximately R180 for 18 years and above, while half rate applies to children aged 17 and below. Maclear’s Beacon is a comfortable 45 to 60 minute walk (one way) from the cable car. The visitors should dress warmly for the top and be prepared for different weather conditions from the city below. Another must see site when visiting the Table Moutain National Park is Cape Point or the Cape of Good Hope, as it was called by King John of Portugal. Cape Point is the very tip of the Table Mountain Range and it is here that the African continent meets the sea. It has been declared a World Heritage Site. The Cape of Good Hope is popularly (though incorrectly) known as the site where the water from the Atlantic and Indian Oceans meet. The site is also known for its lighthouses and historic shipwrecks. A funicular service known as The Flying Dutchman offers an exhilerating ride, rising 238 meters above the ocean to an old lighthouse that was built in 1857 and still keeps watch over the seas. The Cape Point Visitor Centre, also known as Buffelsfontein Visitor Centre, is also a must stopover. You will find beautiful artefacts and audiovisual presenations about the Cape’s rich and diverse history. You can enjoy a meal at the Two Oceans Resturant or look around the souveneirs shops for something to buy. You could also visit Boulders Beach near Simons Town. World famous for its colony of Jackass Penguins, this beach offers a unique experience that visitors of all ages can enjoy. The water here is warm and perfect for a swim, while immense boulders keep strong waves in check, so it’s relatively safer for children as well. The staff at the Table Mountain National Park also offer guided tours to Boulders Beach. For those looking for adventure, the choices vary from hiking to rock climbing, caving and mountain biking. There are 350 marked hiking trails of varying difficulty and Par for the course is about 2.5 hours but is done between 1–3 hours depending on one’s fitness level. Popular tracks include Skeleton Gorge, Valley of the Red Gods and India Venster. You can easily find well documented climbing routes of varying degrees of difficulty up the many faces of Table Mountain. Only traditional rock climbing is allowed on Table Mountain and bolting is prohibited. There are some commercial groups that offer abseiling from the upper cable station. Caves are commonly a feature of Limestone Mountains, yet Table Mountain is an exception as it has several large cave systems that have developed in sandstone. The biggest systems are the Wynberg Caves, located on the Back Table, not far from the Jeep Track, in ridges overlooking Orange Kloof and Hout Bay. Other activities offered by the Table Mountain National Park include overnight trails, fishing/extractive diving, dog walking, free guided walks at Cape Point, scuba diving, mountain biking, surfing/wind surfing, picnic and braai areas, hang/paragliding and horse riding. A visit to Cape Town is by no means complete unless you’ve experienced the city from the heights of Table Mountain. With a wide range of fun family activities available a trip to Table Mountain means that everyone will return with a heart full of bliss and beautiful memories. Kite Surfing, also known as Kite Boarding, is an extreme water sport that involves surfing while using wind power as a propellant. Robben Island is a UN World Heritage site and takes its name from the Dutch, meaning “Seal Island”. Cape Town’s coastal area, including the Sunset Beach, is famous for whale and dolphin spotting. The Milnerton Golf Course is located at a distance of 8km from Cape Town’s city centre and is one of the best Golf Courses in South Africa. Cape Town is an absolute treat for the golf lover. The golf courses of Cape Town offer an unmatched golfing experience. The Victoria and Alfred Waterfront lies at the historic centre of Cape Town’s working harbour. Kirstenbosch National Botanical Gardens are a part of the eight National Botanical Gardens in South Africa. The Cape Winelands in the Western Cape, South Africa are nothing less than paradise on earth.